Since I posted that article, another couple who met as undergrads at Penn came forward with some great wedding shots on Penn's campus. After the jump check them out! Another Penn love story here on DT! 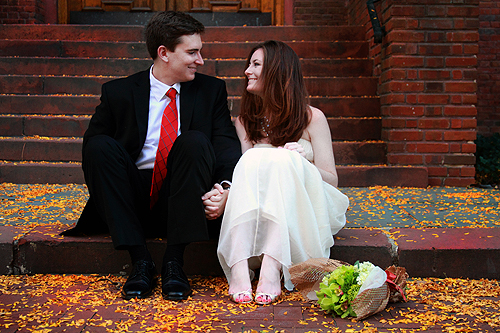 Laura Duvall (C'07) and John Paulett (C'07) got married in the Bishop White room of Houston Hall in September 2010. "We had a small ceremony with our families, presided over by the Penn Chaplain, Chaz Howard." 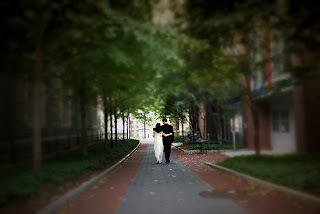 "Laura and I first met in Houston Hall when we were sophomores. I was meeting my bioengineering lab group at Houston Hall, near La Petite Creperie, to work on a report. One of my lab partners originally told Laura he was going to be studying at Houston Hall that night for a different class they were both in, but failed to mention that it was actually a group meeting. Laura stuck around through the meeting, doing her own homework while enduring our engineering-banter. We went on our first date a few months later (the last day before spring break--I just made my flight home that night). I proposed to Laura exactly 5 years later." 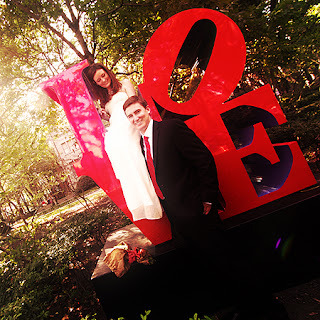 So how can you get married at Penn? 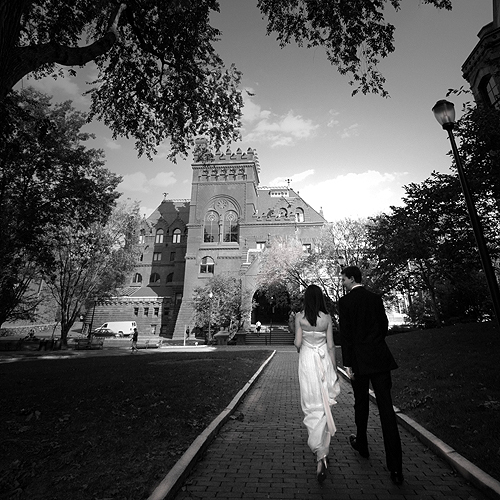 As a Penn grad you're all more than familiar with the old-world style and charm of Penn, so why not incorporate all that memorable Ivy League ambiance into your wedding day? Perelman Quadrangle Special Events at Penn is a new sponsor of DT and I couldn't think of a more perfect fit for all of my marrying DT Penn alumni readers! The beautiful Perelman Quadrangle (which consists of Houston Hall, Wynn Commons, Claudia Cohen Hall, Irvine Auditorium, and College Hall) gives you the opportunity to spend your special day amidst the scenery and memories of your college career; whether you met your future spouse during your stay at Penn, or if you would simply like to share the UPenn campus with your loved one in a special way, a wedding at Penn is a fantastic way to solidify the University into your life as a married couple. 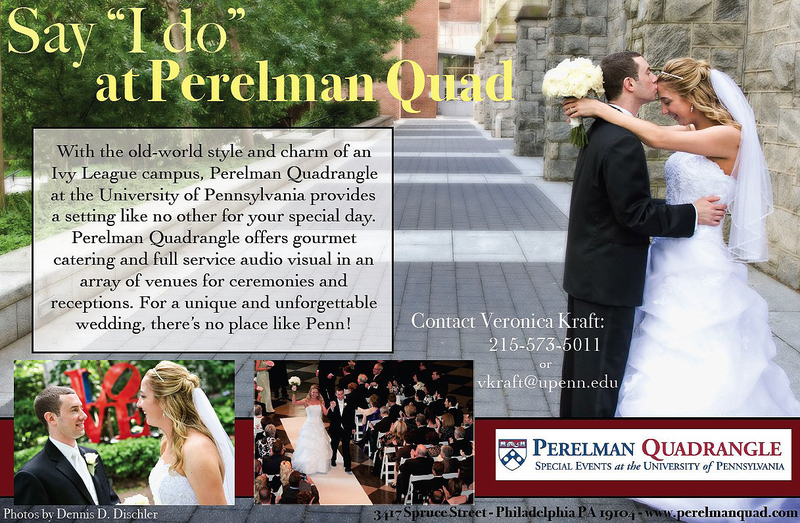 Perelman Quadrangle offers gourmet catering options and full service audio visual in an array of venues for ceremonies, receptions, rehearsal dinners, engagement parties, and showers. Not only do the receptions in the video below look beautiful, but there certainly can be great nostalgia and sentiment having your wedding at Penn!